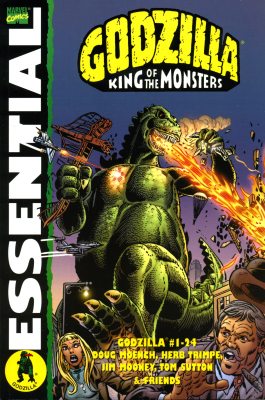 Essential Godzilla – I had a few of the original comics when I was a kid and just had to get the Essential trade with the whole series. 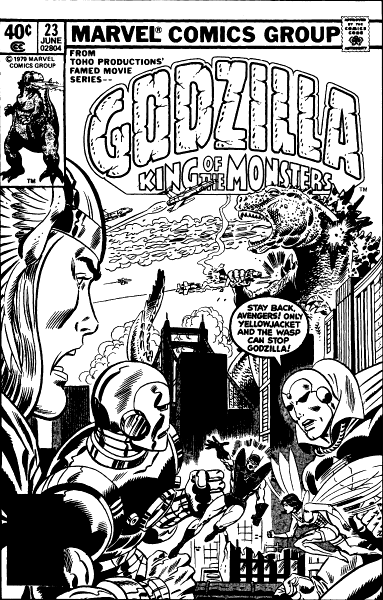 Written by Doug Moench and mostly drawn by Herb Trimpe (also the original artist on my favorite Marvel tie-in comic ever, G.I.JOE), it details what something that seems impossible: what would happen if Godzilla existed in the Marvel Universe. Yes, back in the day, many of Marvel’s tie-in books took place in the canonical Marvel Universe . On the first page of the first issue, breaks out of an iceberg and wrecks up the joint! My friends, that’s how you start off a comic. S.H.I.E.L.D. creates their own anti-Godzilla force led by Dum Dum Dugan, Gabe Jones and Jimmy Woo. They’re assisted by three characters with opinions that correspond to different eras of Godzilla flicks. Dr. Yurkio Takiguchi knows Godzilla as the original destroyer, his 20’s-ish female assistant Tamara Hashioka sees him as the later misguided battler of other monsters while the doctor’s grandson Robert is Godzilla’s number one fan and is much like little Ichiro in Godzilla’s Revenge. Everyone will remind you of a character from an actual Godzilla movie with action hero Woo wooing (I’m sorry!) the beautiful scientist lady and Gabe getting Dugan to admit his grudging respect for the beast. Then there’s the Big G himself who seems to act like a cross between sly, savage monster-battler and the champion of children. So this book is less like a Marvel book that happens to have Godzilla, but a Marvel adaptation of a Godzilla movie with Marvel Characters in it. And I can dig that. Godzilla’s two year world tour has him trampling a path through S.H.I.E.L.D., the Army, the police, many other giant monsters, Yetrigar (a Kong-sized Yeti), Dr. Demonicus, the original Champions, Devil Dinosaur (who later becomes an ally), the Fantastic Four and the Avengers. He gets shrunken down to the size of a rat (and then battles a rat), travels through time, is pulled into outer space and even gets entangled in cattle rustling story. Yes, I’m serious.The coolest development of the book is the revelation that the anti-Godzilla forces have a secret weapon in the form of a samurai-like Super Robot named Red Ronin. What really impresses me is that Red Ronin was made before Marvel got the license for Shogun Warriors which was also written by Moench and drawn by Trimpe. Either way, you have to give Moench props for even coming up with that. Also, much respect to artists Herb Trimpe Tom Sutton & Ernie Chan. Trimpe had a knack for always reminding you of the insanely large scale these monsters were in. Plus, having to tackle so many random settings and themes in such a rapid-fire rate couldn’t have been easy. issue #23 is one of the earliest comics I remember having (though that comic is long gone now) and is part of the reason that I love thinking about crazy crossovers and shared universe concepts. Godzilla was a crazy comic and I’m all the crazier for it. It’s not a groundbreaking comic that changes everything forever or a deep examination of how it feels to be loved and feared by a world that will never fully understand you. 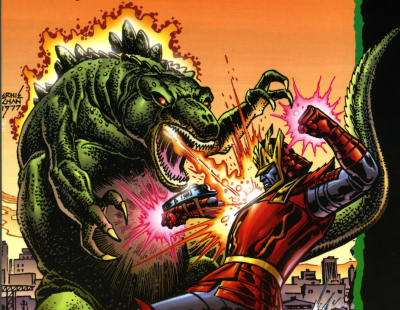 It’s about Godzilla stomping through the 70’s era Marvel Universe, for @#$%’s sake. If that sounds like your kind of happening, then get the Essential Godzilla from your Local Comic Shop (even if you have to order it through them) or hunt down the individual issues. 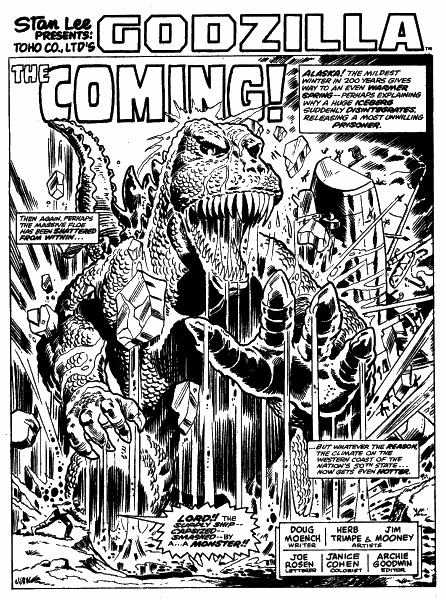 BTW: Herb Trimpe has a website and there’s a great fan site dedicated to Doug Moench here.